Monodendri was the starting point of our seven–day hiking trip. 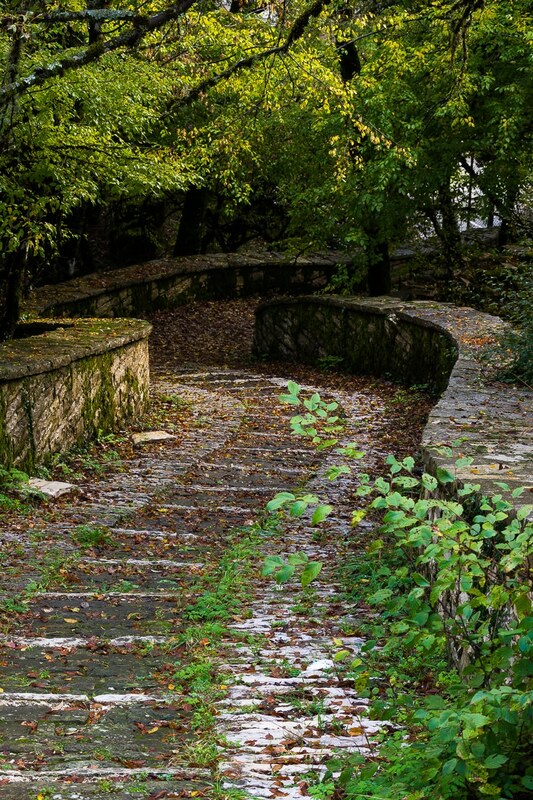 We would leave the car there and begin our journey next morning by hiking Vikos Gorge. Cars are allowed only as far as the parking at the entrance of the village. 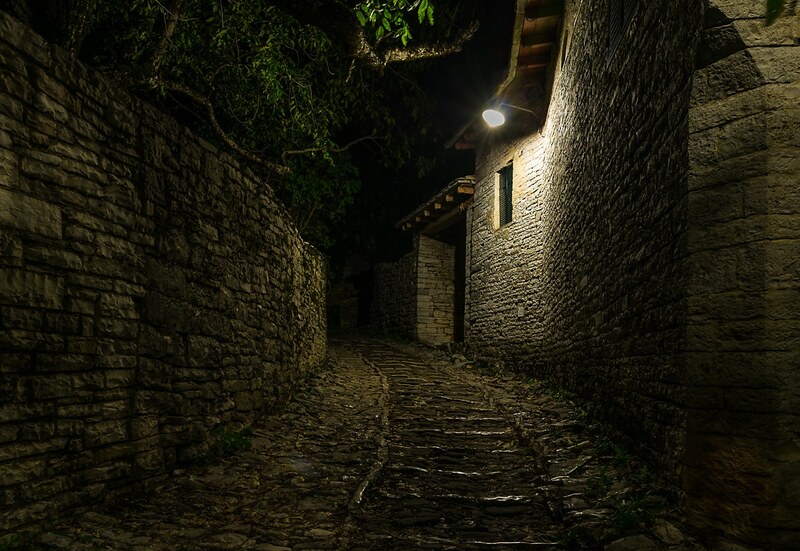 Monodentri is relative crowded compared to other villages in Zagori. It has access to the gorge and is also known because of Ag. Paraskevi monastery which is perched on the almost vertical walls of the gorge and has breathtaking views. Also it is where the famous Rizarios Handcraft school for girls is based. We unloaded our luggage and walked the kalderimi (narrow cobblestone road made for people and livestock) to the central square. Like all the villages of the region, Monodendri has a plane tree, a water tap and of course a kafeneio—the traditional Greek café. Though we would love to sit for a coffee, we headed straight to our hotel which was around the corner to meet our local guide who would provide the support for the whole trip. 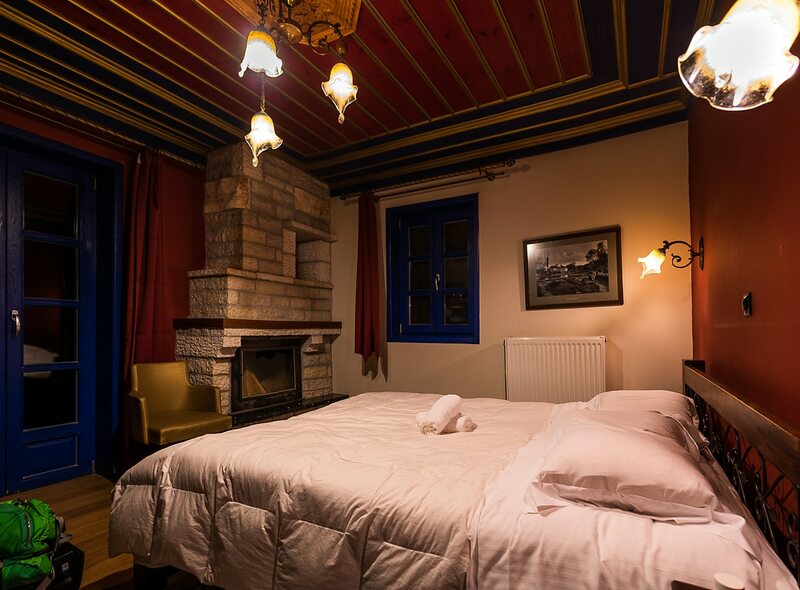 Arktouros is a small hotel housed in two traditional mansions like most hotels in Zagori. These traditional buildings which are protected by law, are an inseparable part of the land. Made only from local stone and wood, they stand, many of them for centuries sheltering people from the heavy winters of Epirus. Our hostess walked us up the stairs and through a long corridor to our room. The wooden ceiling had beautiful patterns sculpted and it was painted in burgundy and deep navy blue. Our room wasn’t big but it was nicely decorated with old gothic furniture. It had a fireplace and a small balcony overlooking the surrounding hills. Beautiful. Nikos was waiting for us in the small lobby which also serves as a restaurant. 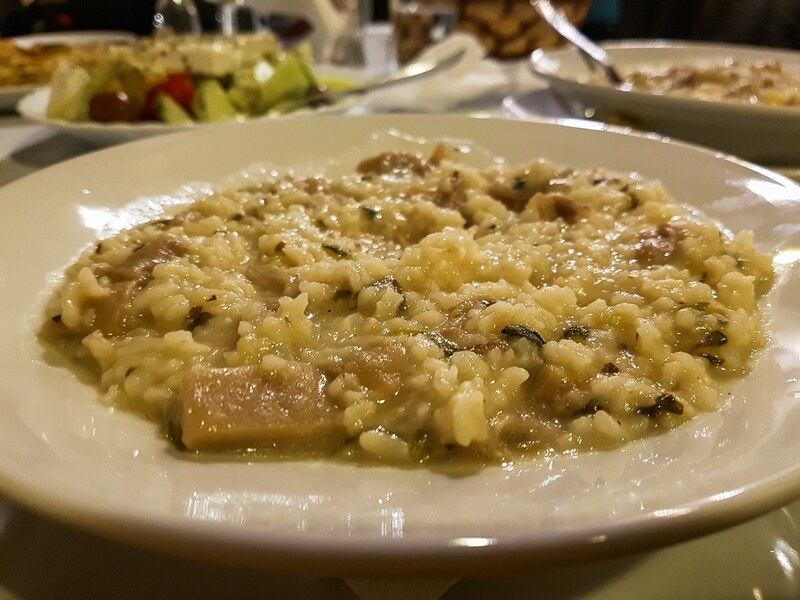 tsipouro, the local spirit made of grapes and small dishes with a variety of food and cheese which we call meze in Greece, were already on the table. What a way to start our briefing after a long day. Two hours and a number of tsipouro shots later, we had spoken about every aspect and detail of the trip for the next week. The good news were that the weather forecast was favorable for now. We would hike from place to place and Nikos with his team would provide supplies, accommodation and make sure that our luggage would wait for us in the room after every tiring day. 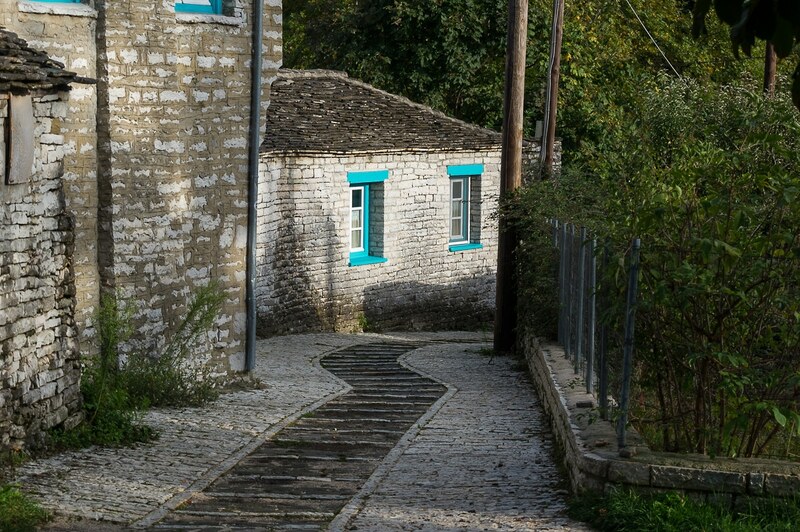 We would hike most of the central Zagori without having to worry about logistics or any other problem that could come up. Ideal for people who really want to go for it but at the same time keep fatigue to a relative low level. Plus we would be able to see as much of this beautiful corner of Greece as possible without worrying about the lack of services or means of transportation in the area. Monodentri to Vikos through Vikos gorge. At the end of the trail Nikos would drive us to Aristi for the night. Short drive to Voidomatis and from there hike along the river to Kleidonia bridge and Ano Kleidonia village for lunch. Finally hike to Megalo Papingo and get a short transfer to Mikro Papingo. Climb to Astraka refuge (1990m) and after a small break, hike to the famous Dragon lake and back before the sunset. Spend the night at the refuge. The longest hike of the trip. Astraka to Tsepelovo village through Megas Lakos gorge. Transfer outside Vradeto village. Hike to the epic Beloi viewpoint and from there back to the village and descend the rocksteps known as Skala all the way to Kapesovo. Finally we hike to Kipi. Essentially a day off with only a two hours hike to Dilofo just to stretch our feet. Transfer back to Kipi. The final hike to our starting point through Koukouli and Vitsa. Veronika would hike with her 35L backpack and me with my 50L because of the camera gear. They were more than enough and the only time we fully stuffed them was on the 4th and 5th day because our luggage naturally could not be carried to the refuge. 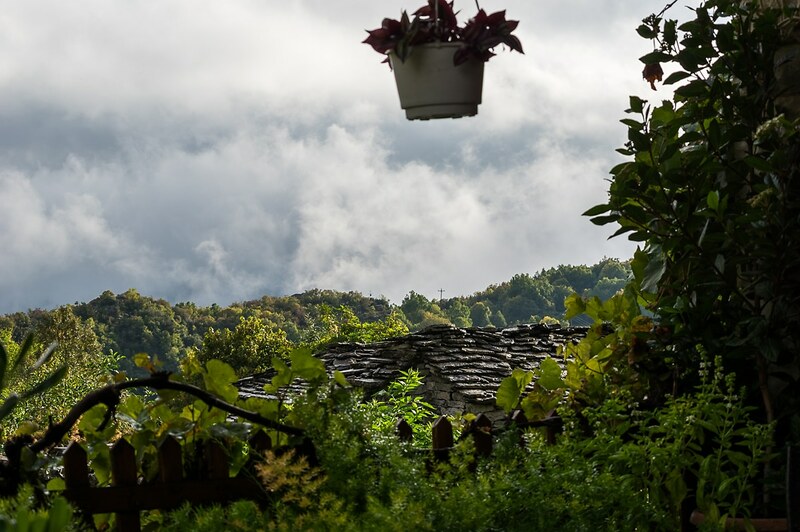 Our clothing was mostly thin layers some of which were rainproof since Epirus is the most rainy region in Greece. We also had the luxury to carry second pairs of boots in our luggage which came in handy.